Breakfast is a meal that many of us struggle with. How do we eat healthy when we are trying to get to work or school? Last week, I was really sad about the new Starbucks' chicken sausage, egg white, and roasted veggie wrap. I was so bummed in fact - that I tried to make something similar. You see, the best FAST breakfasts are planned ahead (the night before perhaps) and they involve vegetables. We don't get anywhere near our 5-7 servings of vegetables and fruits per day - so we need to be vigilant and start the day right. The American breakfast is famously devoid of vegetables and fruit. Eggs, hash browns, toast, sausage, bacon, pancakes.......aaah!! This breakfast seems to come from our farmer roots. If you are a farmer and need a lot of calories - this is the breakfast for you - but, if you are a desk jockey like me - this breakfast is going to end up on your hips. Doesn't that look beautiful? And it smelled SO good. I didn't add any spices, but you could. Ginger, soy sauce, salt, pepper, etc. would be great. I just let the veggies cook a bit, made an egg white omelet and enjoyed. The recipe yields 4 servings of breakfast veggies and I could share if I was feeling generous. If I cook something like this and leave it in the fridge - I find that it is gone before I know it. Everyone likes to jump on the healthy train if I do the work. How do you incorporate veggies in your breakfast? Scrub zucchini and slice in half, lengthwise. Slice in half lengthwise again and slice. Heat large skillet on medium high heat and add oil. Add onion and cook until soften. 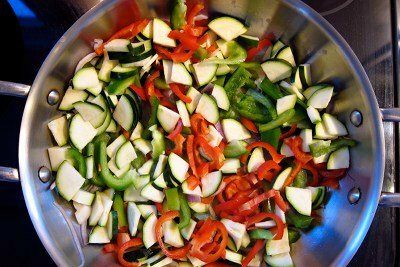 Add red bell pepper, green bell pepper, and zucchini and cook (stirring often) until you achieve your desired tenderness of veggies. Mine take about 10 minutes. Spray an omelet pan (or small fry pan) with nonstick spray. Heat over medium heat, add egg whites. Cook until cooked through - about 2 minutes. Does A Breakfast of Frosted Mini-Wheats Help You Focus? Snack Girl had some nutritionists help her come up with the Healthy or Crappy Cereal Test to help readers decide which cereal is best for breakfast. Love it...you have inspired me! Oh yes. My favorite. I do this most mornings. To really save time, I will saute' my veggies (enough for several breakfasts) and store them in separate snack size ziplock bags and put them in the freezer. Just pull them out when needed, throw them in a skillet with a bit of coconut oil (very healthy fatty acids) or olive oil. They will thaw quickly, then add your eggs. So quick and yummy. Oh, and I also throw in some fresh spinach too if I have it. No need for toast, you have all the carbohydrates you need in the veggies and a lot more nutrition! another great idea I found somewhere online (thank you to whoever it was) French toast w/out the toast. Whisk 2 eggs and add a splash of pure vanilla extract and ground cinnamon (can be generous cinnamon is so good for you) pour in an omelet pan and let set, flip and let set on other side. Put it on your plate, spread with unsweetened applesauce and fill with bananas, strawberries, blueberries or fresh fruit of choice. If you want you can drizzle with honey or pure maple syrup. (The vanilla and cinnamon give the eggs a sweet taste already tho) Nice treat without the wheat! I love to make a veggie omelet with sauteed fresh spinach & mushrooms, too! I like egg-beaters, but can't always afford them...(Thanks for the tip about freezing the veggies ahead of time, Jennifer! I, too, love coconut oil.) You could even throw it in a tortilla & make a wrap for on the go! Looks great! You are so right - when someone else does the work, everyone eats healthier - I guess this is why moms are so great! Another shortcut - if we have veggies leftover from the night before, I'll save them. You can do a quick microwave egg beater scramble with the veggies - put it into a Bagel Thin or pocket, with a wedge of light cheese - WW 5 point breakfast that is really filling. Although... getting away from the bread altogether is even better! @Laine! Thanks for the idea..I didn't know I could freeze them AFTER sauteeing them! That will help me immensensly with my weekly breakfast/lunch prep! We have tons of fun with breakfast here! Not only do I hide raw greens in our smoothies (I am the QUEEN of that) but we make scrambled tofu with sauteed veggies (eggs too, but only if we can get them from an actual farmer), breakfast sandwiches with loads of spinach and tomatoes, and whole wheat and cornmeal pancakes with "fruit syrup" (I put frozen fruit in a pan until it melts beyond recognition) or just bananas cooked in maple syrup (or bananas IN the pancakes. We really love pancakes here!). For when we're strapped for time, I like to make healthy quick breads (like molasses bread!) in muffin tins to keep the portion sizes in check. Sometimes I'll nuke it, split it, and add some nut butter for protein. Yum! We really, really, really love breakfast! they eat veggies with every breakfast in Scandinavian countries. Just saying. In the breakfast freezer section of your store, they sell pre-diced combos of veggies, meat, and potatoes and i love to have those on hand when i'm in a hurry. I usually add a small can of mushrooms to it and whatever other leftover veg's i have in the fridge if i have time. Sauté the veggies, add a few eggs, and voilá! Breakfast in a bowl! My fave is the one with ham in it already. Mmmmm. Make extras and they warm up very quick and easy for a 2nd helping the next morning, too! Courtney, if I do say so myself, your breakfast dishes sound fit for a Roman emperor. Yes, that is a compliment. Yum! Looks delish! I love veggies for breakfast!! 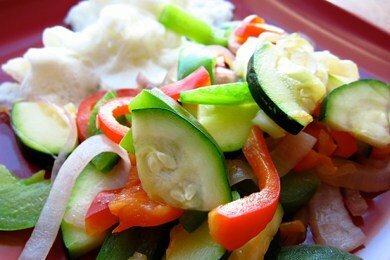 I have done vegetables like this and tried over pita bread (10 min. in oven). I will do it with eggs, it sounds great! My question: Why only egg whites? Do you put in the eggs or serve separate? I am just starting weight watchers this week. These ideas are WONDERFUL. Thank you so much. @Rita - I was just trying to reduce the calories with using only egg whites. I like yolks and use them too. Thanks for the question! Another possibility is adopting an Asian approach to breakfast every now and then -- try saute-steamed vegetables (chard, bok choy, spinach, etc.) with bits of tofu, miso soup, rice -- popular breakfast items in Japan and China. Sometimes I just take frozen edamame and saute in a cast iron pan, add some frozen veggies (spinach or green beans), and eat this with a small slice of rye or wheat bread. So good!